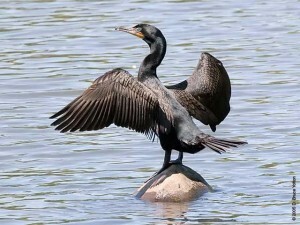 Cormorants are magical diving birds whose bodies are more equipped to swim under water than to fly in the air. Known in ancient Latin and Germanic languages as the “sea raven”, cormorants make a presence in your life when it is time to overcome obstacles and see possibilities. The cormorant brings earth-bound sensibilities and an amazing ability to navigate emotions. The cormorant invites you to dive into life FEARLESSLY, and to dive deep into the emotional realms knowing that you have evolved to do this, and you will always rise to the surface once you have gotten what you need from the depths. The cormorant is prominent in Celtic and Native American design, and is an Ojibwe clan name as well. This implies reverence and acknowledgment of this bird in ancient times. The cormorant is all about self-reliance, wit, and a powerful ability to move through watery emotion with the power of feet and wings; then to translate that movement into forceful sky flight. The cormorants in my neighborhood perch on a tree overlooking the river, and return each year to this same tree. As I watch them balancing on high branches in the wind, I learn of their tenacity and what they will endure for a high view of their area. They surf the wind, greet each other, and socialize in stable patterns, even under heavy gusts. The cormorant teaches us that life goes on, a high perch is worth the effort, and that it is perfectly fine and well to use your evolved abilities to live and move through more than one element; in this case air and water. Cormorant power supports realization of seemingly impossible goals, dissolution of obstacles, and the application of multi-faceted skills which surprise and dazzle outsiders. May these energies be with you as well.